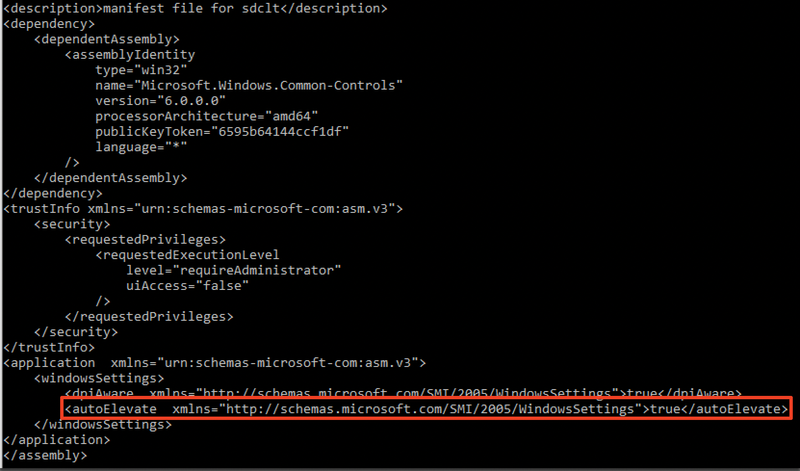 Recently, I published a post on using App Paths with sdclt.exe to bypass UAC. You may remember that the App Path bypass required a file on disk. Since sdclt.exe is out there, I figured I would publish another bypass using that binary, only this one is fileless. I mentioned it in my previous post, but the Vault7 leak confirms that bypassing UAC is operationally interesting, even to nation states, as several UAC bypasses/notes were detailed in the dump. As far as public bypasses go, definitely check out the UACME project by @hfiref0x, which has a nice collection of public techniques. In newer versions of Windows, Microsoft has shown that they are taking the bypasses seriously. This has motivated me to spend a little more time on UAC and the different methods around it. As I mentioned in my last post, a common technique used to investigate loading behavior on Windows is to use SysInternals Process Monitor to analyze how a process behaves when executed. I often work some basic binary analysis into my investigative process in order to see what other opportunities exist. These were interesting as sdclt.exe is set to auto-elevate in its manifest anyway. Looking at sdclt.exe in IDA, it checks if the argument matches “/kickoffelev”. If it does, it sets the full path for “sdclt.exe”, adds “/KickOffJob” as a parameter and then calls SxShellExecuteWithElevate. Following that path, SxShellExecuteWithElevate starts “%systemroot%\system32\sdclt.exe /kickoffjob” with the “Runas” verb. This is essentially programmatically executing the “RunAsAdministrator” option when you right-click a binary. The next step is to run “sdclt.exe /Kickoffelev” with procmon running. After going through the output, we see the trusty “shell\<verb>\command” registry search path in the HKEY_CURRENT_USER hive. The next step was to add those keys and see if our binary and parameters of choice would execute. Unfortunately, nothing executed after adding the keys and starting “sdclt.exe /kickoffelev”. Looking back in procmon, our keys are queried, but sdclt.exe is actually looking for an additional value within the “command” key: “IsolatedCommand”. This is the same bug (minus the IsolatedCommand portion) that was used in the eventvwr.exe “fileless” UAC bypass. 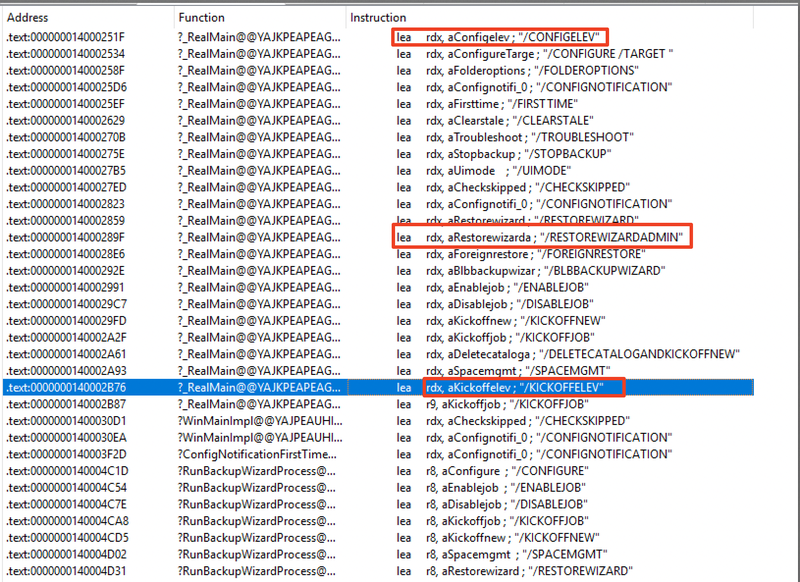 You can read about the eventvwr.exe bypass and the specific registry keys used here. Notice that instead of “shell\open\command”, we now see “shell\runas\command”. This is because sdclt.exe was invoked (again) using the “RunAs” verb via SxShellExecuteWithElevate. The script takes a full path to your payload and any parameters. “C:\Windows\System32\cmd.exe /c notepad.exe” is a good one to validate. It will automatically add the keys, start “sdclt.exe /kickoffelev” and then cleanup.